In 1891, when the Keokuk Union Depot was built, five railroads offered passenger service to and from the city. 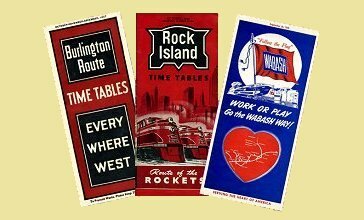 These were the Chicago, Burlington & Quincy ("Burlington Route"); the Chicago , Rock Island & Pacific ("Rock Island Lines"); the Wabash Railroad; the Toledo, Peoria & Western; and the Keokuk & Western Railroad (absorbed into the CB&Q in 1901). This page provides some information about passenger service during the Depot's heyday, in the 1930s and 1940s. Passenger service ended in 1967. Keokuk has never been served by Amtrak, which took over passenger service from most United States railroads on May 1, 1971. The TP&W ended full passenger service in the early 1930s but was known for its excellent freight service, about which some brief information is also provided. 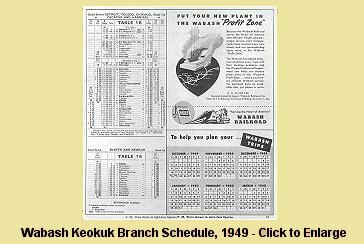 View the Depot Timetable for July 1, 1938.
gas- or diesel-electric cars) operated weekdays on the former Keokuk & Western, running between Keokuk and Humeston or Clarinda, Iowa. Mixed trains (both freight and passenger) offered additional service on an irregular schedule. The best-known train to traverse the Burlington's line through Keokuk was the Mark Twain Zephyr, train 43 northbound and 44 southbound, placed in service in October 1935. 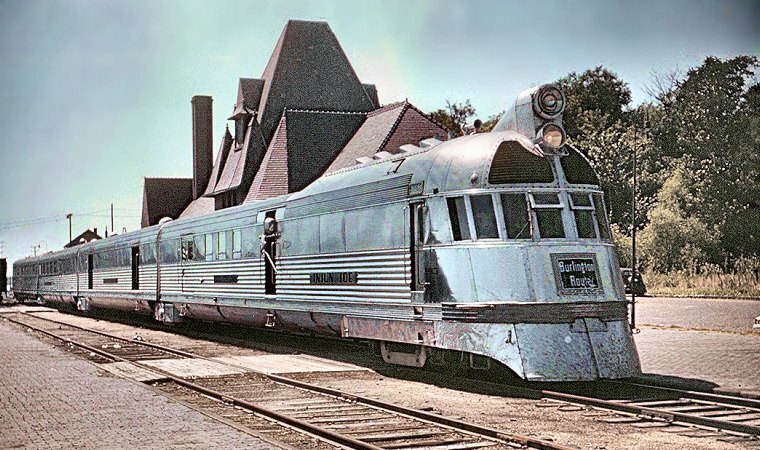 It was the Burlington Route's fourth streamlined, stainless-steel, diesel-powered train set, after the famous Pioneer Zephyr of 1934 and the two Twin Cities Zephyrs introduced earlier in 1935. A photo of the Mark Twain Zephyr making the station stop at Keokuk appears at the bottom of this page. The Mark Twain Zephyr along the Mississippi, as depicted on a postcard. Like the original Zephyrs the Mark Twain was an inseparable, articulated train; its four cars shared the same truck where they connected. The cars were given names in keeping with the Mark Twain theme, appropriate to the Mississippi River territory through which the train operated. The baggage-express car was called Becky Thatcher, the dinette-coach car Huckleberry Finn, and the final coach-lounge car Tom Sawyer. 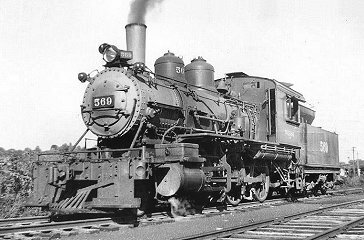 The power car, officially locomotive 9903, was named Injun Joe; it had a 660-horsepower diesel engine that powered the first truck only, and its rear section was a mail car. Read a letter written in 1937 by a passenger on the Mark Twain Zephyr. The Mark Twain Zephyr equipment did not serve the line through Keokuk continuously. At times it was reassigned to temporary service elsewhere on the Burlington system, its schedule presumably covered by conventional equipment. From 1957-1963 the Mark Twain Zephyr equipment returned to the Burlington-St. Louis route, but evidently under another name. After this assignment the train was retired and sold for display. It still exists, stored in derelict condition in Madison, Illinois and for sale to anyone who can meet the owner's price and arrange for its transportation to another location. Burlington Route train 43 on June 15, 1954. 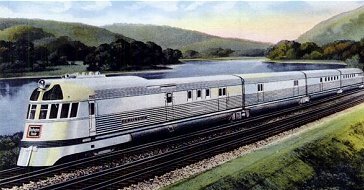 After the first four Zephyrs the Burlington Route ordered additional Zephyr equipment. The new trains were not articulated in each case, so that additional cars could be added when required. The first locomotives for these trains had the same "shovel-nose" styling as the earlier ones, but were self-contained units. When newer diesel units replaced them, these locomotives were assigned to regular passenger, mail and express service. In the photo above, unit 9908 (called the Silver Charger) has stopped at Keokuk on its St. Louis-Burlington run with CB&Q train 43 on June 15, 1954. The unit is preserved at the Museum of Transportation in Kirkwood, Missouri..
A September 1959 Burlington Route schedule shows two trains each way through Keokuk, including the Zephyr Rocket (see next column). After 1963 only the latter served Keokuk, augmented by local bus service. The Rock Island entered Keokuk from the west, in a line that ran from Des Moines through Oskaloosa, Ottumwa, Eldon and Keosauqua. 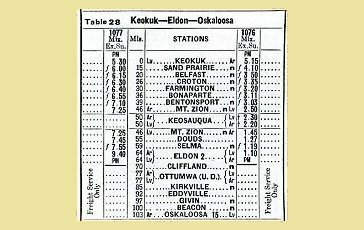 An October 1948 public timetable shows a mixed train in each direction between Keokuk and Oskaloosa. The line was abandoned in the 1980s and only a stub remains along the Des Moines River south of Keokuk, used by Pioneer Railcorp for car storage. 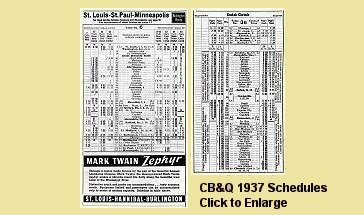 On January 7, 1941 the Burlington and the Rock Island introduced a joint daily overnight train between St. Louis and Minneapolis, styled the Zephyr Rocket. On CB&Q rails between St. Louis and Burlington, the new train took over numbers 15 northbound and 8 southbound from earlier trains. Each railroad contributed an Electro-Motive diesel passenger unit as power, and many of the cars were streamlined "lightweight" equipment. 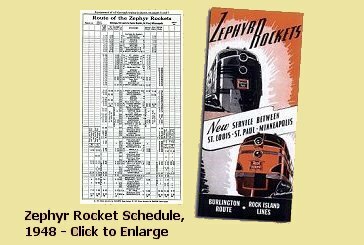 The Zephyr Rocket operated until April 8, 1967, losing its name near the end, and was the last passenger train to serve Keokuk. A number of local residents recall riding the train to nearby locations. View the clearance form for the last passenger train through Keokuk, April 7, 1967. The Wabash Railroad reached Keokuk on a branch line from Bluffs, Illinois. Between Elvaston, Illinois and Keokuk, Wabash trains used the Toledo, Peoria & Western line by trackage rights. A public timetable issued September 25, 1949 shows the schedule for the mixed train on this branch. Passengers, who must have been few and far between, were allowed to ride in the caboose. The September 1959 issue of The Official Guide of the Railways shows the same schedule still in place, but this service ended a few months later when the Illinois River bridge at Meredosia was closed at the behest of the U.S. Army Corps of Engineers, severing the line. The Wabash, and successor Norfolk & Western, continued to reach Keokuk with freight service over the remaining portion of the branch until its abandonment. 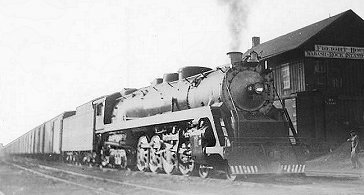 Wabash Mogul (2-6-0) type No. 569 at Keokuk, June 8, 1942. 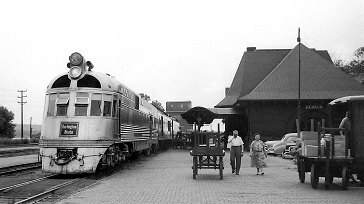 The TP&W operated a mixed train between Peoria and Keokuk, but this service ended by 1950. Being a "bridge line" between eastern and western railroads that bypassed congested Chicago terminals, however, the railroad publicized its fast freight operations nationwide. with a train of refrigerator cars, probably in the late 1930s. In 1937 the TP&W received six new Northern (4-8-4) type locomotives that greatly expedited its freight service. During this period the Rock Island handed off a train of refrigerator cars to the TP&W at Keokuk, the products of western packers and growers destined for eastern markets. The new locomotives sped their train across the Mississippi River bridge and onward to the TP&W's modern icing facility in East Peoria. Donate through the Depot Foundation. Write to Keokuk Union Depot, P.O. Box 463, Keokuk, IA 52632.